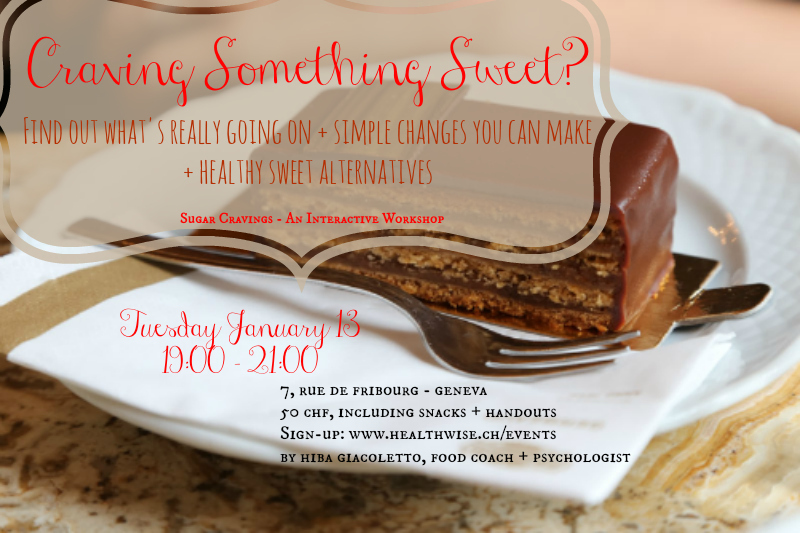 BY THE END OF THE WORKSHOP, YOU SHOULD HAVE A CLEARER UNDERSTANDING OF YOUR CURRENT RELATIONSHIP TO SUGAR AND HOW TO REDEFINE IT SO YOU HAVE FEWER CRAVINGS AND MORE ENERGY. 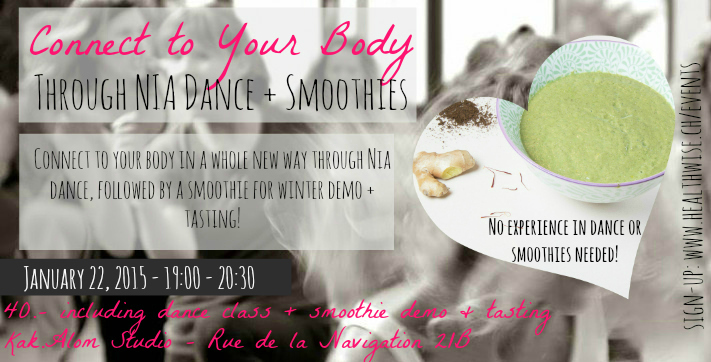 55 minutes: Nia dance with Katia (Certified Instructor) - no prior experience needed - anyone can do it! 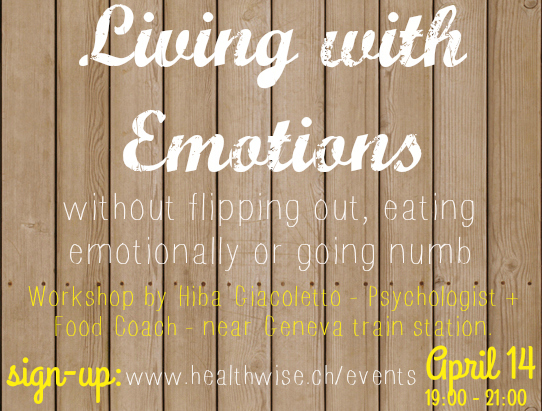 Join Nia Dance Teacher, Katia Mikhailova and Psychologist + Food Coach, Hiba Giacoletto to connect more deeply with your body through Nia dance and Intuitive Eating. Nia dance empowers people of all shapes and sizes to connect to their body by paying attention to sensation. 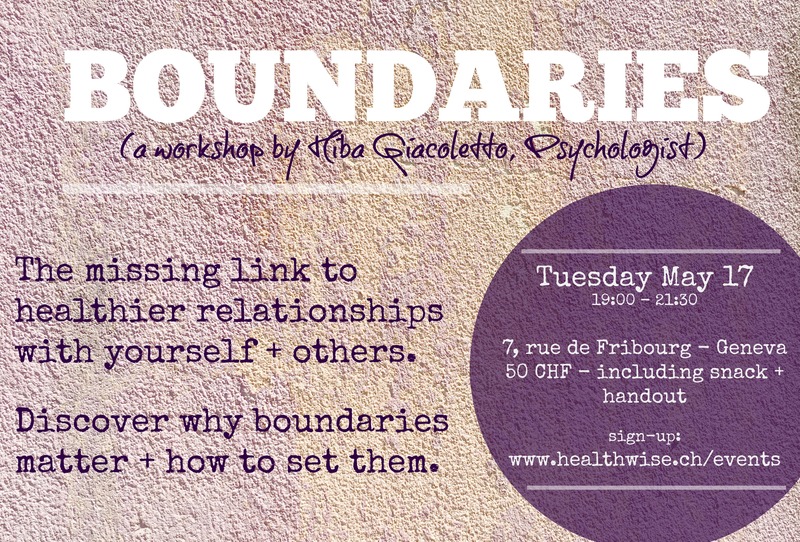 By embracing ‘The Body’s Way’, you are encouraged to listen to your body and move in a way that feels right for you. 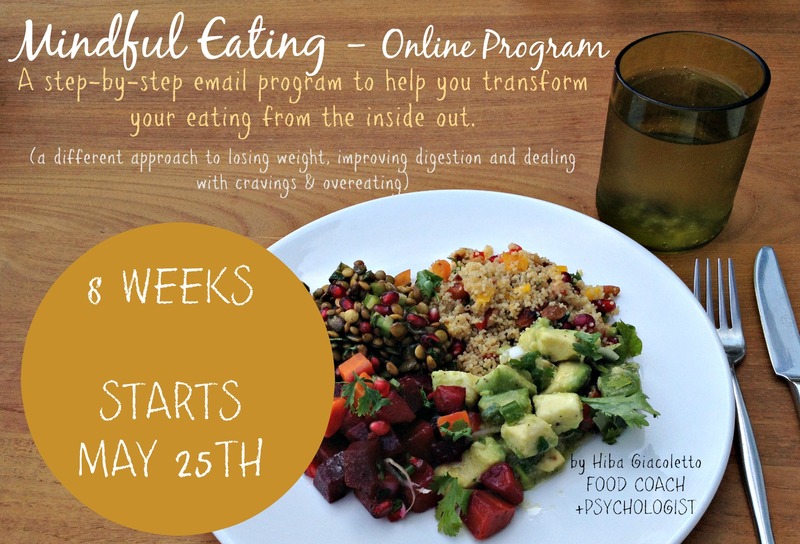 Intuitive Eating is about letting go of diets and finding a way of eating that works uniquely for you. By learning to listen to and trust your body’s needs, you are able to make peace with food while making healthy choices from a place of intuition and pleasure rather than discipline or deprivation. 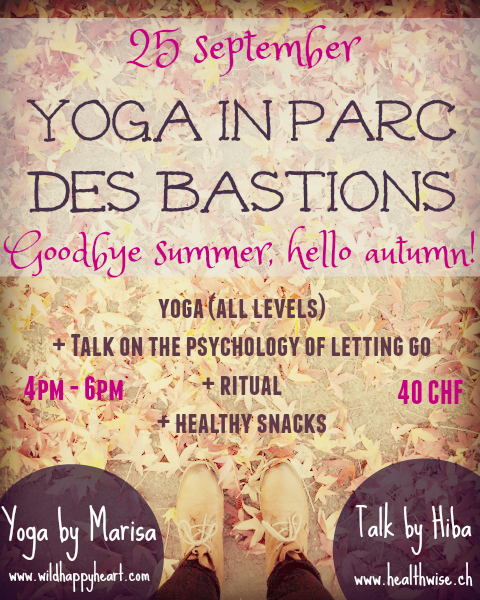 Fun dancing and eating exercises will allow you to experience how letting go of control and tapping into a body wisdom that is in all of us, enables you to connect to a greater sense of peace, freedom and intuition. Dress comfortably for the movement exercises. You won't sweat but you will have more fun. 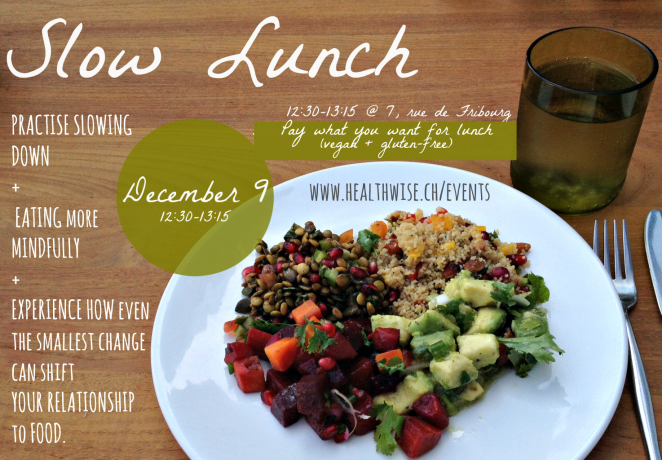 THIS EVENT IS NOW FULLY BOOKED - SIGN UP FOR MY NEWSLETTER TO STAY UP TO DATE ABOUT THE NEXT SLOW LUNCH. All proceeds from this event will go to Room to Read to support girls' education in developing countries - find out more here. 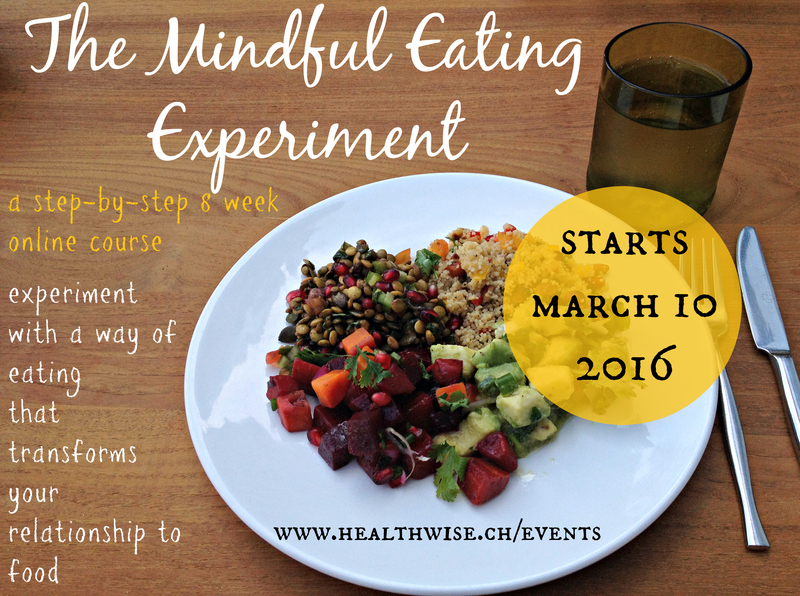 A UNIQUE MIX OF PRACTICAL + THEORETICAL LEARNINGS, YOU WILL LEAVE WITH THE KNOWLEDGE AND INSPIRATION TO BRING MORE MINDFULNESS TO YOUR MEALS. 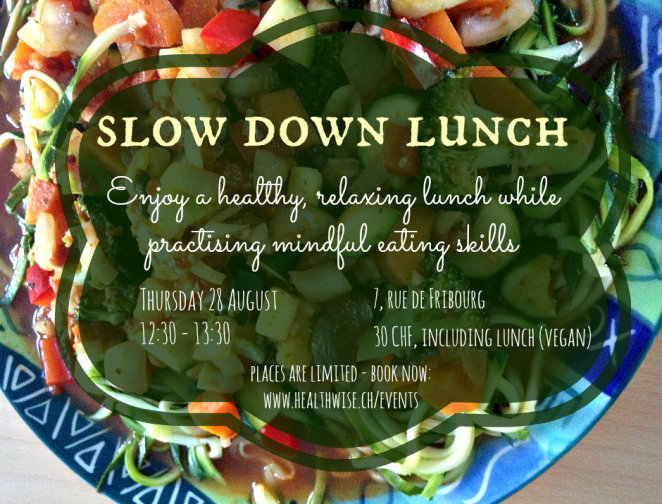 SLOWING DOWN AND EATING MORE MINDFULLY HAS BEEN SHOWN TO HELP WITH DIGESTION, WEIGHT LOSS AND EVEN DEALING WITH CRAVINGS. MORE THAN FOCUSING ON WHAT YOU EAT, IT FOCUSES ON HOW YOU EAT. 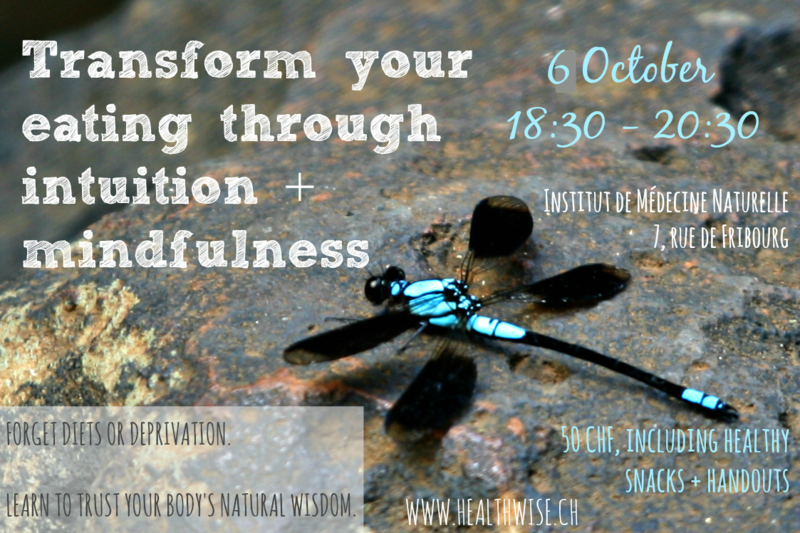 MINDFUL EATING HAS COMPLETELY CHANGED MY RELATIONSHIP TO FOOD AND I HOPE TO BRING THIS ACROSS IN THIS SESSION! Ever wish you could trust your body to move in a way that feels free and creative? And what if you could bring this freedom and creativity to the kitchen? 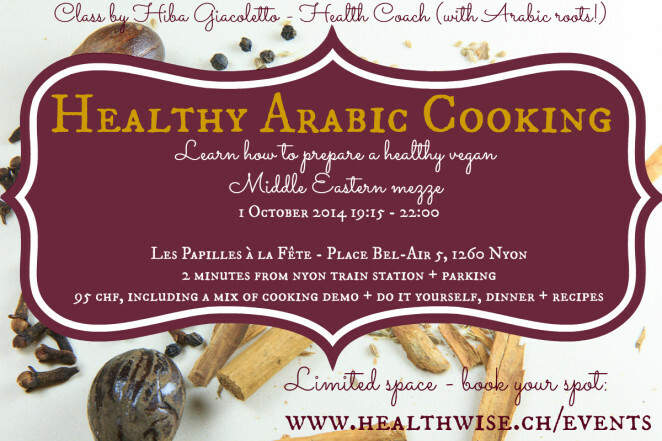 In this unique workshop, Katia (Nia Certified Instructor) + Hiba (Food Coach) join forces to enable you to experience how learning the building blocks of dance or cooking - in this case making hummus - empowers you to become more free to experiment. …to both your dancing and cooking. 1h10 minutes - Elements of free dance intro + Nia free dance class. Anyone can learn to Free Dance - all you need is music and your body! 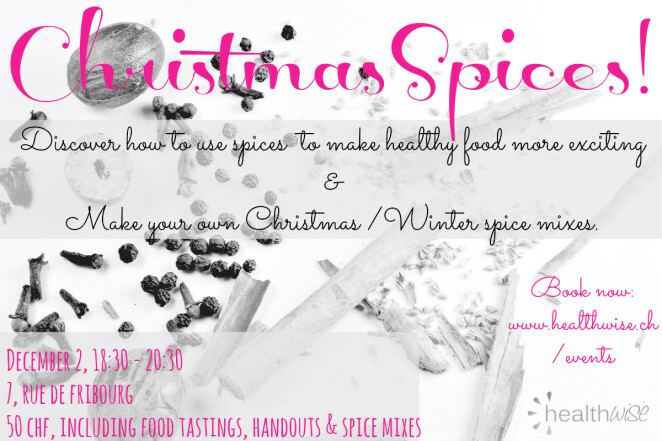 50 minutes: Hummus demonstration + tasting 3 different types of hummus - Discover the elements involved in making hummus and how easy it then becomes to create variations. By the end of the workshop, you will discover how the principles of Free Dance are among the underlying foundations for exploring the body and self, for expanding beyond your comfort zone while dancing through life. 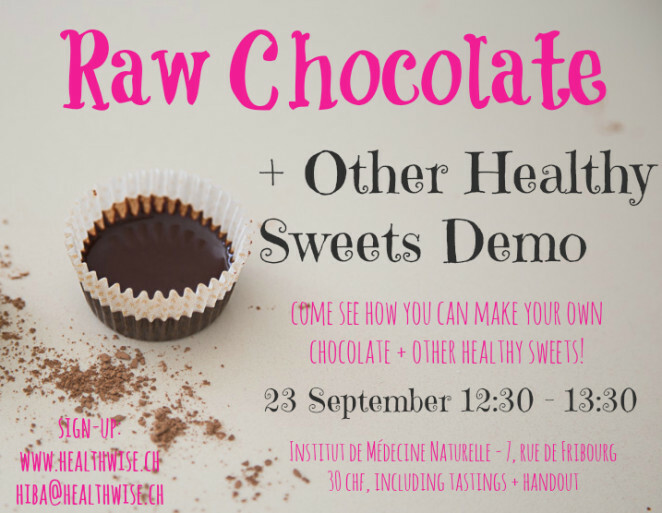 Come and watch how to make your own chocolate then practise eating it mindfully! 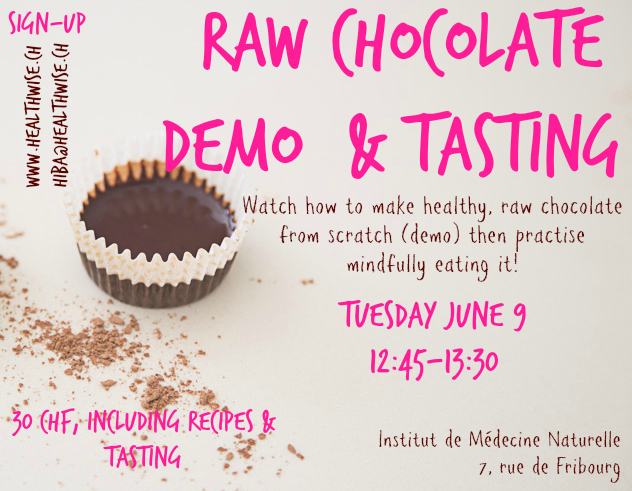 This is a great way to learn how to make raw, healthy + delicious chocolate which takes just minutes to make, while also experiencing how to taste chocolate in a way that makes it even more pleasurable - and allows us to be satisfied with less! 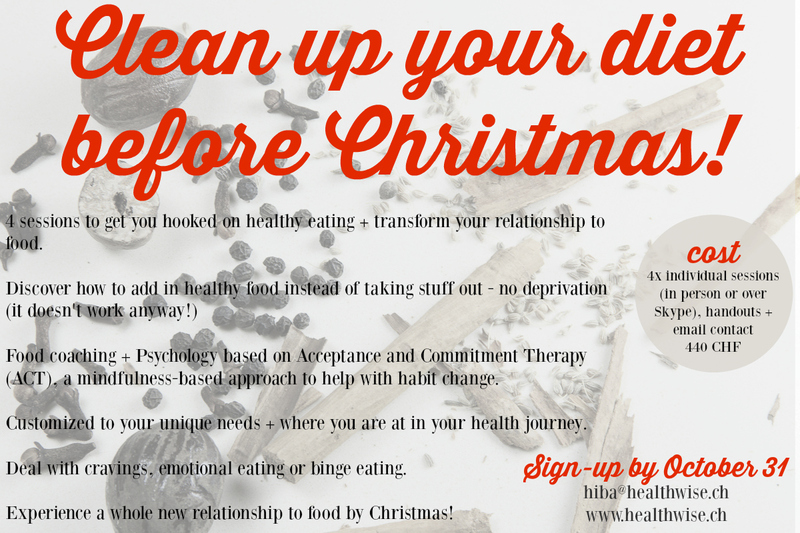 Clean Up Your Diet Before Christmas! 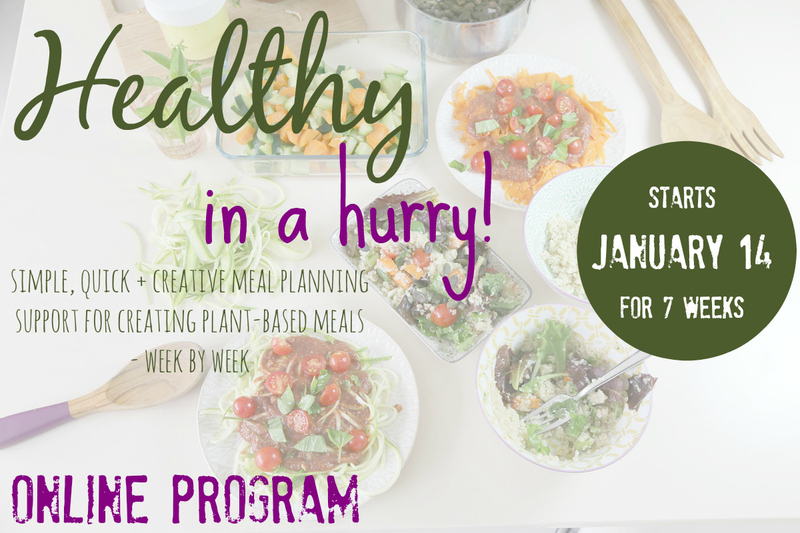 ♦ 4 sessions to get you hooked on healthy eating + transform your relationship to food. 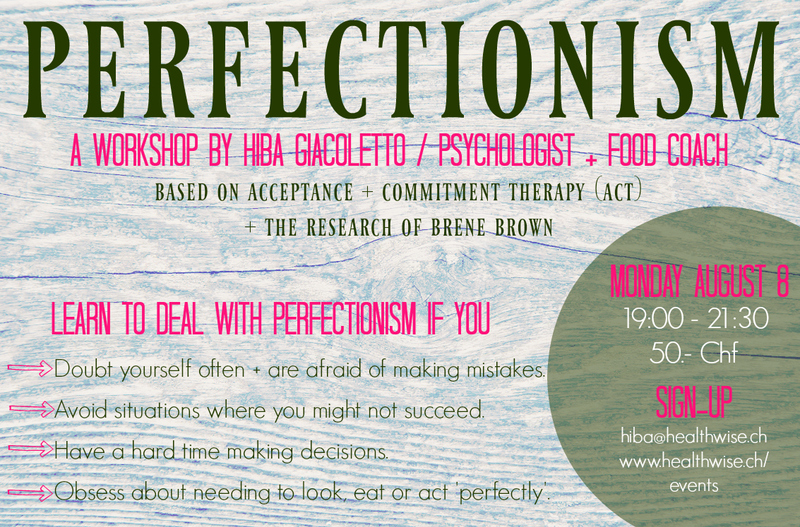 ♦ Food coaching + Psychology based on Acceptance and Commitment Therapy (ACT), a mindfulness-based approach to help with habit change. 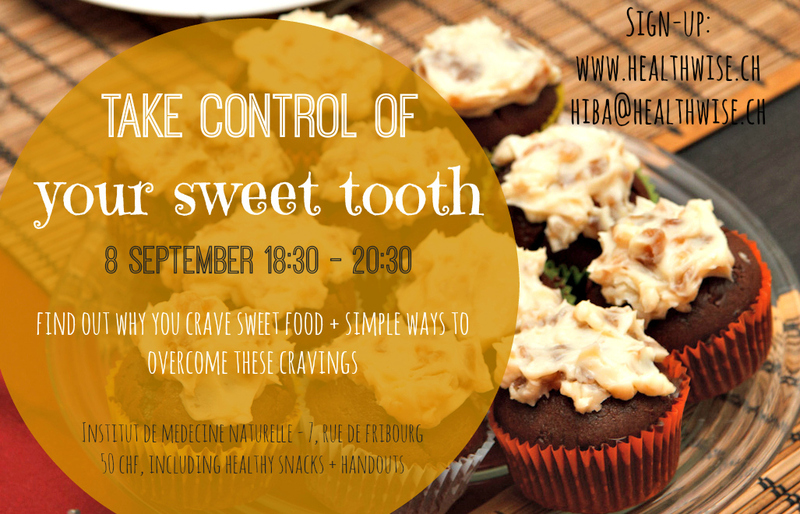 ♦ Deal with cravings, emotional eating or binge eating. ♦ Experience a whole new relationship to food by Christmas! 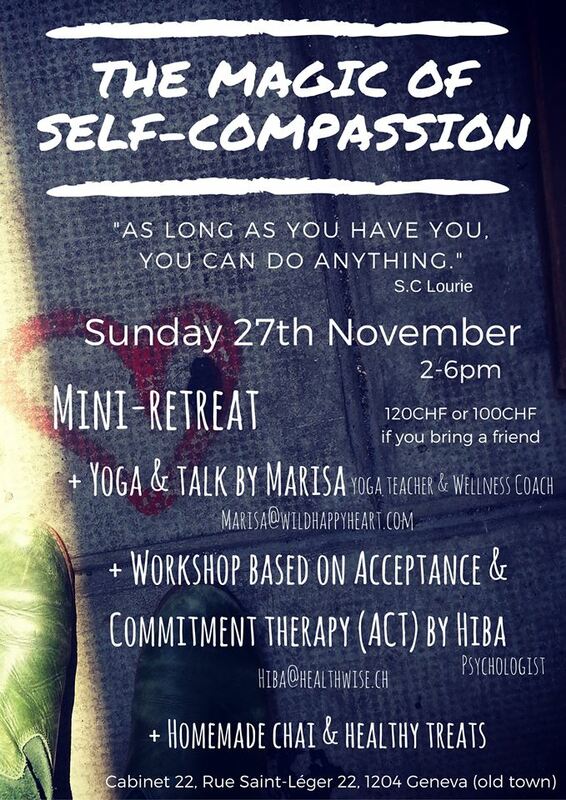 Cost: 440 CHF, including 4x individual sessions, handouts + unlimited email contact. Sign-up by October 31 to get started! All sessions must be used before December 15. 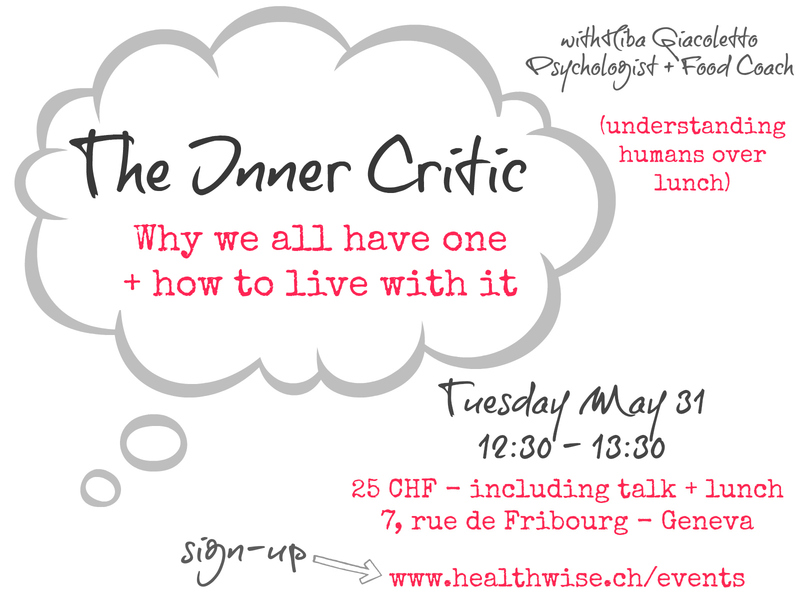 Sessions are in person in Geneva (7, rue de Fribourg) or over Skype. 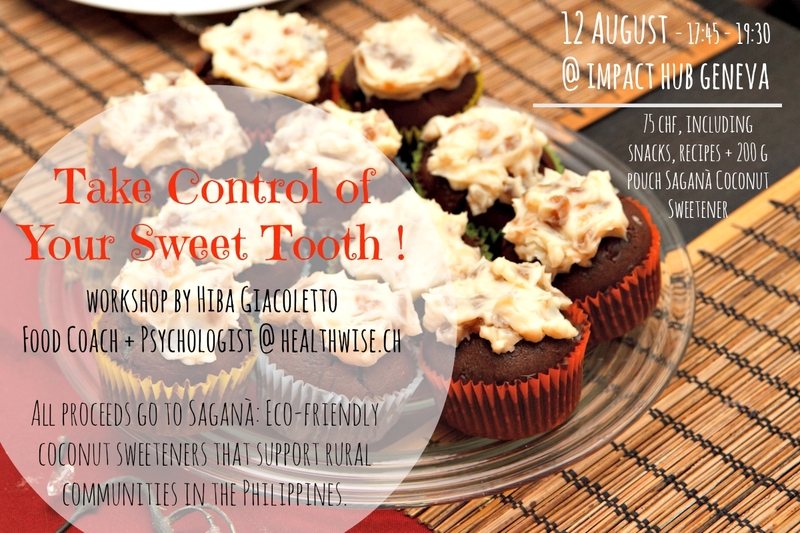 Dancing and eating both have the capacity to bring us in the body and out of the head for a few moments. And when we add a more sensuous approach to these activities through our five senses - smelling, touching, hearing, seeing, tasting - we experience the body in a whole new way. More pleasure. More connection. More aliveness. Come and experience it for yourself. Discover your five senses. 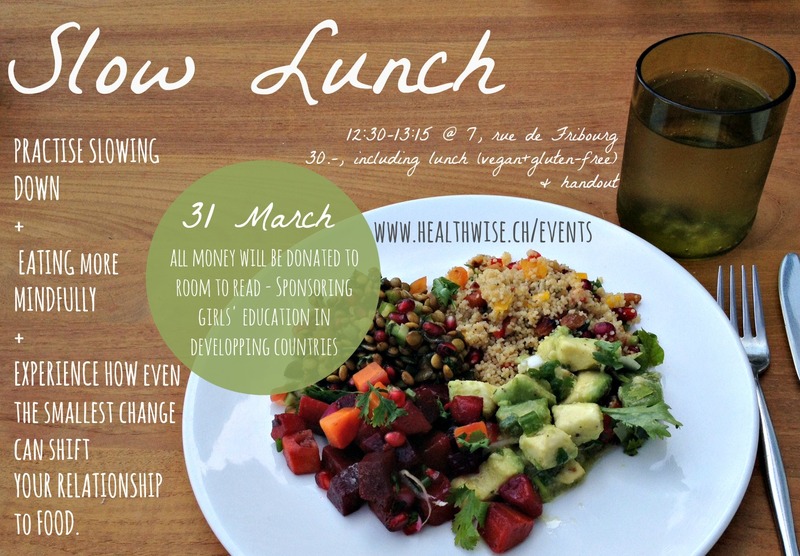 Price: 40 CHF - Nia dancing, followed by sensuous eating experience. 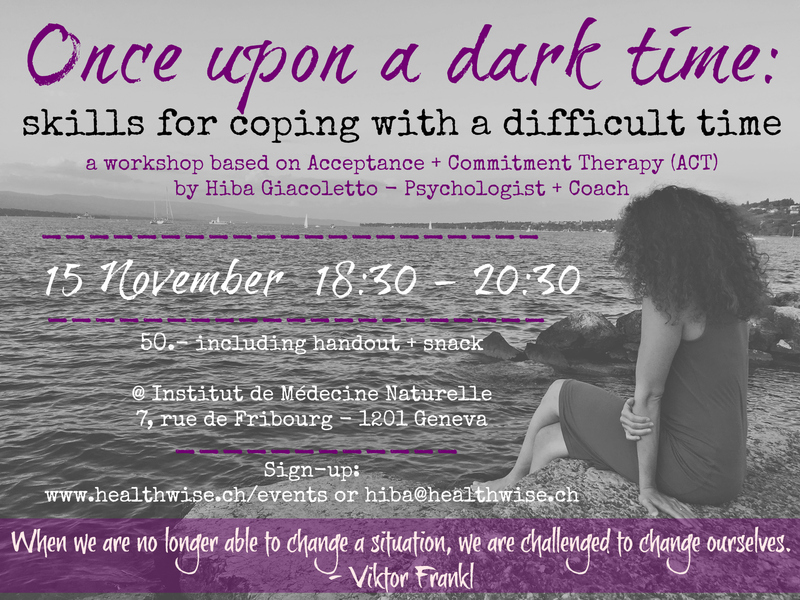 This workshop is now fully booked - I will be holding it again in January - you can sign-up for my newsletter to be the first to know about it! 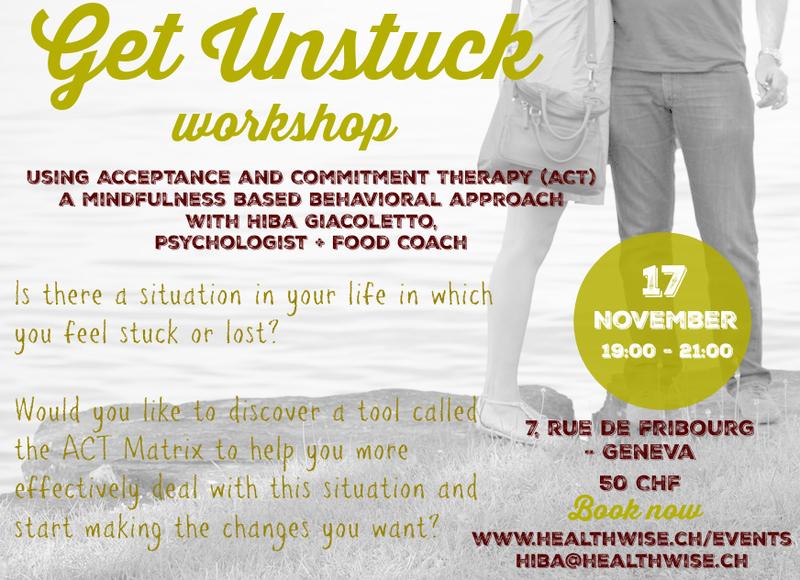 Is there a situation in your life in which you feel stuck or lost? 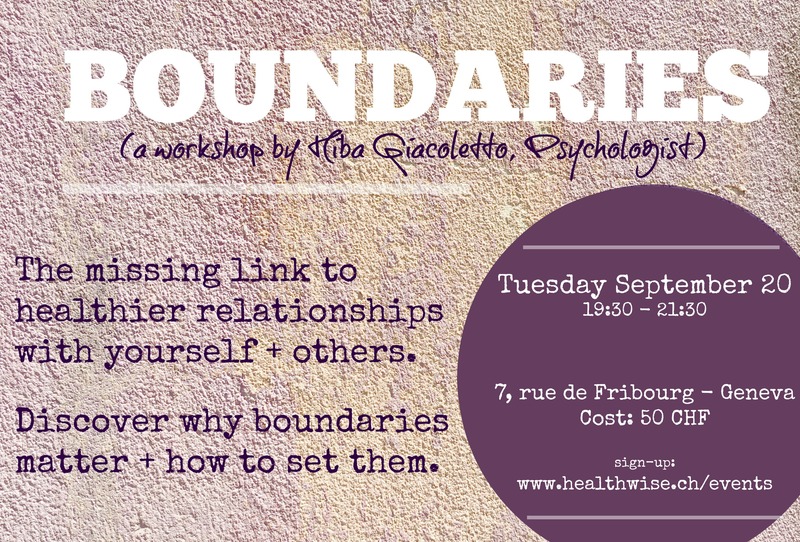 Do you feel like you are getting in your own way? Perhaps it is the way you always react with someone, like your boss or spouse? Perhaps you feel stuck in emotional eating or binge eating? Maybe you know you want to make a change like eating more healthy or exercising more yet can't seem to do it? Or not really knowing what to do next in your career or life? Whatever the situation, discover a tool called the ACT Matrix which will help you gain awareness and clarity so you can choose the actions you take next in this situation more effectively. 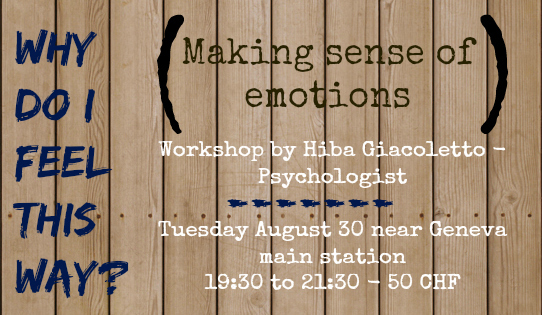 After the workshop, you will also be able to use this tool yourself in other areas of your life. 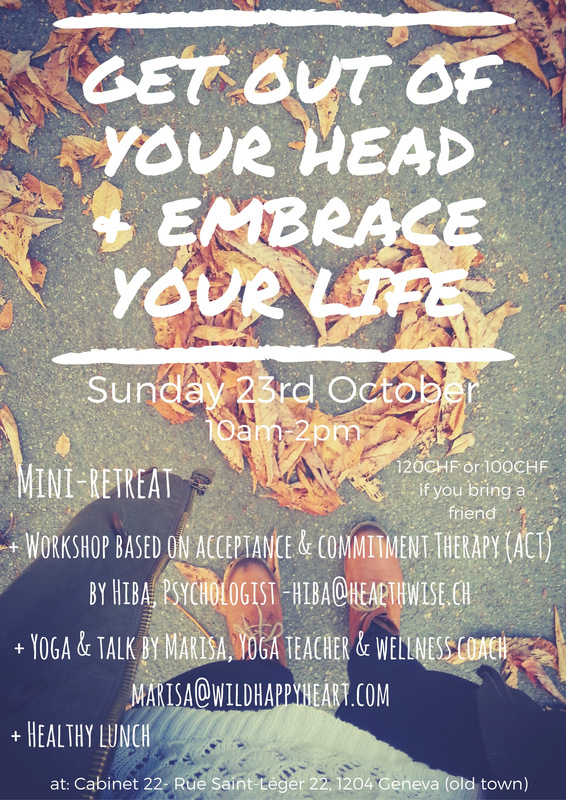 This interactive workshop is based on Acceptance and Commitment Therapy (ACT), a mindfulness based behavioral approach with Hiba Giacoletto, Psychologist + Food Coach.